Panama wines are not yet well known, but maybe they should be. 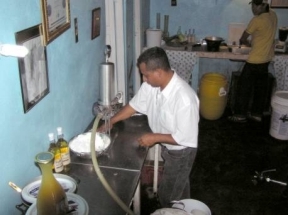 Forty-three--year-old Jorge Quintero Rubio spent 18 years working in one of Panama’s leading breweries as a quality control officer. Four years ago, he decided to start out on his own. His venture into the beverage business is modest even by microbrewery standards – his tiny Alpine style winery barely covers 900 square feet but his products have a mammoth potential. 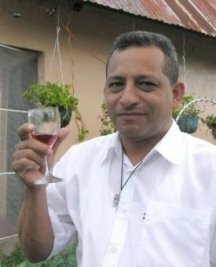 His Panama wines, organically produced from local fruits, include a broad range from pineapple, passion fruit, raspberry and strawberry, to the highly publicized noni. It is this last concoction that really attracted my attention. I have read about it, and heard all the great anecdotal stories associated with noni – claims that it has cured all manner of ills from fatigue up to and including cancer. The trouble with noni is that it tastes plain bloody awful. I have had a bottle in my fridge for almost eight months, I know it is supposed to be good for me, and I've accepted that my body needs it. But that awful taste has made me consign it to the nether regions of the refrigerator. Yesterday changed all that, when I discovered some of the benefits of Panama wines – other than the expected. 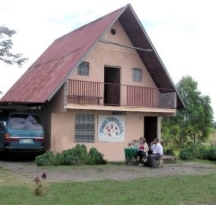 My wife, Lydia, and I drove out to Jorge’s modest winery located in the Chiriqui mountain town of Volcan. Jorge graciously offered us a taste of various wines. The clear favourite was a rhubarb and aloe vera mix. Then he brought out his own special concoction of noni mixed with a fruit I had never heard of, called borojo. Amazingly, the mix was more than palatable; it was downright delicious. Jorge claims that several of his clients have experienced remarkable benefits from this mix. One 48-year-old man with intestinal cancer claims he was cured within six months. The man lives in nearby David, and Jorge regularly takes him a supply of the noni and borojo mix. I have asked to meet the gentleman to try to verify this amazing story. In the same Volcan area, I met a young man who was rendered a quadriplegic by an infection and was in a near vegetative state. His distraught mother was advised to give up on her son as nothing could be done for him. But she patiently administered her own wine mix of herbs and noni, and her son now has the use of his arms, can talk and feed himself – and the last I saw, he was a week away from walking again. Jorge waxes lyrical about the other amazing ingredient in his magic elixir – the incredible borojo. This fruit is famous in both Panama and Colombia as an aphrodisiac and for its health properties. Tests have shown it to contain huge quantities of essential amino acids and its levels of water soluble Vitamin B are higher than just about any other fruit. Surprisingly, the phosphorous content is 60mg per 100g of pulp. Borojo has been demonstrated to be effective in treating hypertension, bronchial infections, maintaining sugar equilibrium in the blood and in increasing sexual potency. It is also claimed to help vegetarians regulate their protein and amino acid levels. Jorge, an obvious master of Panama wines, sells this nostrum for the unbelievably low price of $6 for a 750-ml. bottle – but if you buy a case of 11 bottles, and promise to return the empties, the price drops to $4 a bottle.